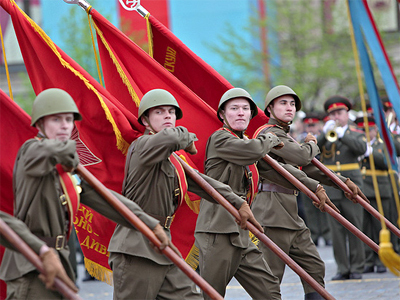 Russia is marking Victory Day - 66 years since Nazi Germany was defeated in World War II. Events of commemoration and celebration are taking place across the country, including a traditional grand military parade on Red Square. The Moscow parade comes as largest-scale in Russian modern history, with a march of about 20,000 troops. The grand event was preceded by three night parade rehearsals and also a general rehearsal on Red Square. The parade, which started at 10am Moscow time on Monday, consisted of marches, and a demonstration of military hardware, vehicles and aircraft. This year, 106 units of military armory rolled over the main Moscow Square and five helicopters hovered over the spectators. Heavy military vehicles were wearing special tracks not to damage the cobblestones of Red Square. Spectators had a chance to see modern Russian military machines, such as Tiger and BTR-80 armored vehicles, T-90 tanks, self-propelled artillery installations Msta-C, mobile missile launching systems "Topol-M" and many others military units. For the first time in the history of the Victory Day parade, 200 officers from Russia's Space Corps joined in the march. Russian President Dmitry Medvedev, Prime Minister Vladimir Putin and many other country’s officials also attended the parade. Dmitry Medvedev addressed the veterans and participants of the military march and said that Russian people harbor a special, cherished attitude towards those who fought and won the war. “We are proud of the people, who returned from war and, within a short period of time, raised the country from ruins, restored its industries and agriculture, were first to space, achieved great success in education, culture and science,” the Russian president said. “Our duty is to keep the peace achieved as a result of the Victory,” he added. 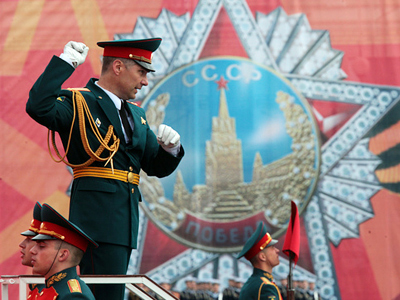 The parade is the main display of Russia’s military forces. 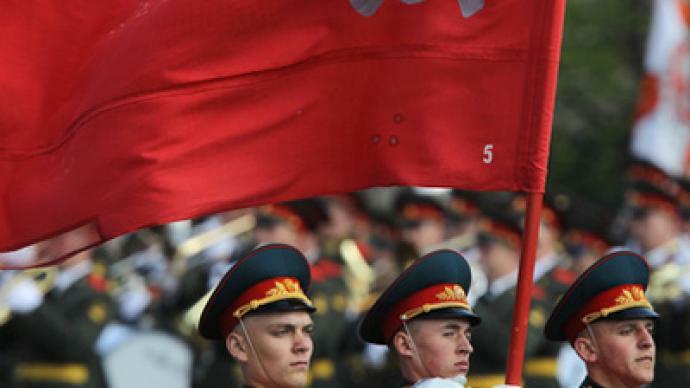 Military analyst Igor Khokhlov says Russia’s army is undergoing important changes. “A massive military reform is now taking place and the basic idea is to have a smaller force, the head count is as about one million now in Russia, but the idea is to have a mobile, very effective [force],” Khokhlov says. “If the Russian army becomes smaller you have to thing about the quality. The army is reducing its head count from 1.1 million to almost 1 million. The number of contract soldiers is going to triple within a few years,” he adds. ­Watch RT's coverage of the Victory Day parade. Part 1. ­Watch RT's coverage of the Victory Day parade. Part 2. About 100 military parades were held all across Russia on Monday to honor the anniversary of the great victory over Nazi Germany. In the Siberian city of Novosibirsk over 1,500 troops marched across the city, followed by a demonstration of military vehicles, both modern and those used to fight the enemy in the Great Patriotic War. 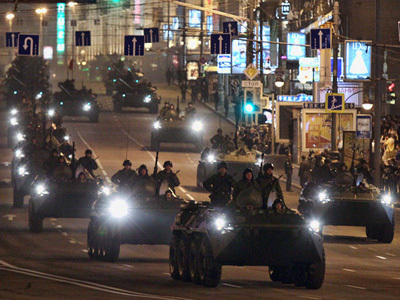 In Vladivostok, over 1,000 troops, including navy cadets, marched on the city’s embankment. There was also demonstration of Russian Pacific Fleet armory. ­At 7pm Moscow time Russia held a minute's silence – a tradition that underlines the sad note of the holiday – for the incredible efforts to defeat Nazism, which cost 27 million Soviet lives. The minute of silence is dedicated to those who made the greatest sacrifice for victory and freedom. ­As night fell on the Russian capital, the 66th-anniversary commemorations of the victory over Nazism culminated in a spectacular firework display. This year 30 salvoes from almost a hundred launchers and guns lit up the sky above the capital. The fireworks could be seen from almost any spot in the city, as the shots were fired from 13 locations, including Victory Park, which always attracts tens of thousands of spectators. The tradition repeats the historic fireworks back in 1945, when Moscow's skies glowed with artillery shots, welcoming the news that Nazi Germany had surrendered and the exhausting, destructive war was finally over. ­Victory Day is a holiday of great significance in Russia, first of all, due to the sacrifices of the Russian people in World War II, believes historian Sergey Kudryashov. ­However, Denis MacShane, former Minister of State for Europe, says while celebrations of Victory Day are important, the rise of new ultra-nationalist movements should not be neglected. “We salute the sacrifice to heroism and the achievement of wiping out fascism, but we also must never let the new extreme-right wingers in Europe denigrate what the Russian soldiers and Russian people achieved,” said MacShane.